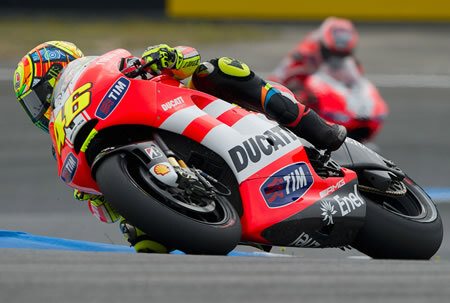 Photo: Valentino Rossi of Italy and Ducati Marlboro Team rounds the bend during the free practice of MotoGP of Portugal in Estoril Circuit on April 29, 2011 in Estoril, Portugal. (Photo by Mirco Lazzari GP/Getty Images. © 2011 Getty Images). 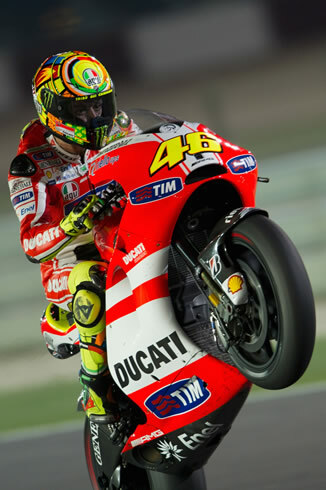 Photo: Valentino Rossi of Italy and Ducati Marlboro Team in action in Losail Circuit during the Qatar GP for the start of 2011 World Motorcycle Championship season (Photo by Mirco Lazzari. © Mirco Lazzari & Getty Images).